Several years ago we were contacted by an editor working for the textbook publisher, Scott Foresman. She said they were putting together an art textbook for elementary school students and felt that Painted Ponies illustrated an important lesson in the creative process. She wanted permission to use three images of Painted Ponies in the book, and to have a fourth appear on the cover. Of course we were honored to be approached by a prestigious educational publication, and asked what the lesson was that Painted Ponies illustrated. The response was "Unity and variety." As it was explained, an artwork has unity when all the parts seem to go together to make a whole. And when you looked at the designs on Painted Ponies � all the lines, shapes and colors � they all had parts that came together in the creation of a "painted pony." 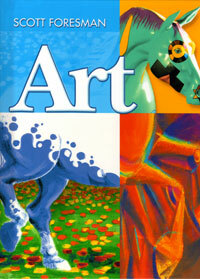 Below are a few sample pages from this wonderful art textbook.